Like many products, modern marketing techniques have encouraged car manufacturers to come up with a wide array of different models to appeal to various market segments. This means that unheard of names (think the VW Touareg) or meaningless letter-number combinations (like the Hyundai i30) are randomly stuck onto vehicles that won’t be in production in 10 years’ time as the company moves on to the next marketing wheeze. However, some cars have managed to transcend that quagmire of meaninglessness, with names and models that have stood the test of time. These cars have become definitive and iconic and have remained in production for decades. These long-lived models also provide a fascinating insight into car design history, with each new generation being representative of the era in which it was created. 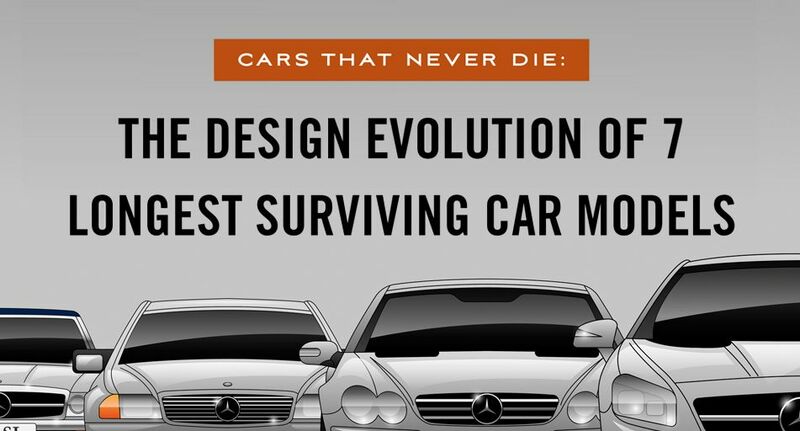 It’s for this reason that we decided to honour these longest lasting cars by illustrating their evolution over the years to become the vehicles we know today. Before the Civic’s release, Honda was actually considering pulling out of car manufacturing altogether. That all changed in 1972 however, as the subcompact Civic became a massive global hit due to its reliable engine and great fuel efficiency. The Civic has gone through ten generations of alterations which has also seen it being a showcase for Honda’s renowned engine manufacturing abilities, with it being powered over the years by its famed CVCC, VTEC and K engines. Introduced in the mid-1960s the Ford Mustang ushered in the glory age of American “pony” cars, sporty and stylish 2-seaters on affordable compact car chassis. The Mustang has become an icon of American lore and is often used in popular culture as a sign of youthful rebelliousness. Named after a similarly iconic World War 2 fighter plane, the Mustang broke many sales records on its release. Though it had been expected to sell less than 100,000 models per year Ford ended up shipping over 1 million of the vehicles in its first 18 months. The SL (Sport Leicht or Sport Lightweight) range from Mercedes is one of the longest-running sports cars ever created. The car certainly makes a statement and has cemented Mercedes’ place as a premium car marque. It is currently sporting some serious power under the hood, with the engine options topping out with an awesome 6-litre V12. Its AMG high-performance version is particularly prized by connoisseurs. This reliable family car from the makers of the “best built cars in the world” became the highest selling car of all time in 1997 when it overtook the VW Beetle. The Corolla has been through 11 generations and is thus a perfect way to see how car styles have changed over the past five decades. The car has been the archetype of Japanese motor engineering, showing how mass-produced cars could be made cheaply yet still remain stylish and reliable. Slick and stylish, the Jaguar XJ has been defining British motor style for generations, with its distinctive racing green evoking images of roaring across the English countryside. Around 12,000 XJ’s are sold every year which makes them Jaguar’s flagship model. The XJ was the last Jaguar to have input from the legendary founder of the firm, Sir Willliam Lyons, and its place in British culture is notable as it is the car in which the royal family and the Prime Minister are driven. The diminutive and aptly named MINI is another huge British automotive icon. It was originally created by the British Motor Corporation in the late 1950s in reaction to the fuel shortages and petrol rationing of the time. Due to its size and lack of heavy internal fittings it was also a surprisingly nippy vehicle, as most famously shown in The Italian Job which saw several Minis being involved in a major gold heist and then evading police through their versatility. Even though it was originally only designed as a show car, it proved so popular that General Motors decided to produce it properly. It has always been a very high-performance sports car, with the first version offering a 4.3-litre V8 option and the current generation capable of speeds over 200 mph. Due to its high cost however, it has generally been a car for the affluent, as opposed to the more affordable Ford Mustang. This is demonstrated by the fact that the median age of Corvette owners is 53. Through a variety of style, economy or sheer class, all of these cars have become global favourites and outlived their contemporary rivals to become legends of the automobile world. With our illustrations you can clearly see how they have adapted to changes in tastes and styles to stay at the top of their field for so long.